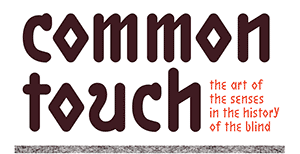 The “Common Touch” audio tour, including texts written by curatorial staff, was completed in consultation with Trish Maunder of Philly Touch Tours. Philly Touch Tours mission is to provide equal opportunities in cultural settings for people with vision loss. To achieve this mission, the organization provides accessibility consulting, sensitivity training and instructional workshops for cultural and educational institutions and inclusive, sensory tours and experiences for people with vision loss in and around the Philadelphia area. You can access the exhibition audio tour, including navigation cues, using your mobile device and the links below. Three audio players containing these tracks are also available for you to borrow at the Library Company front desk. You can download the files by clicking the links below. You can stream the files by clicking the links below.